2 Why does pain occur? 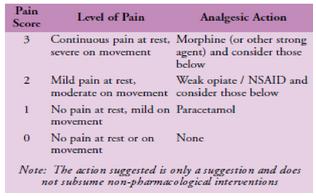 Assessment should seek to establish the type of pain present. In addition to completing a pain chart, measurement of pain intensity is objectively helpful. The brief pain inventory (BPI) is one method of charting the intensity of symptoms, however it takes time to administer. The 0-3 VAS is an easy to administer scale which highlights when intervention is required. It is also easy to fit it with the WHO pain ladder (Figure 1). In short, scores of 0 and 1 (nil to mild pain) require no intervention, 2 and 3 (moderate to severe) requires immediate action. 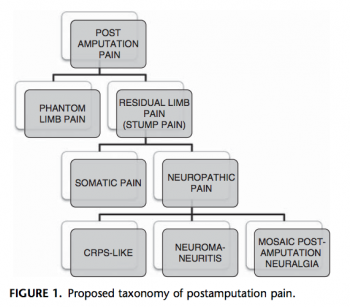 See the image below for the proposed taxonomy for post-amputation pain. Pain Management: Post-Amputation Pain. inMotion, 1998, 8(2). Phantom and stump pain. StopPain.org, Department of Pain Medicine and Palliative Care. Pain management. Australian Physiotherapists in Amputee Rehabilitation.. Pain managmenet for patients. National Limb loss information center. Transcutaneous electrical nerve stimulation (TENS) for phantom pain and stump pain following amputation in adults (Review). Mulvey MR, Bagnall AM, Johnson MI, Marchant PR, Cochrane Library, 2010, Issue 5. Privitera R, Birch R, Sinisi M, Mihaylov IR, Leech R, Anand P. Capsaicin 8% patch treatment for amputation stump and phantom limb pain: a clinical and functional MRI study. Journal of pain research. 2017;10:1623.